Is there any subject that excites so many emotions in indie authors than Amazon? From its ever-changing programs for self-publishers to its shifting positions on book reviews, Amazon is both the democratic gateway to the biggest market of book buyers in the world, and the 800-pound gorilla overshadowing our world. Trying to figure out the best way to use the services Amazon offers for ebook and print book publishers can be daunting. Looking around at what’s available to help authors with the processes and procedures they encounter when dealing with Amazon, it was hard to find anything comprehensive. There are good training courses and products that help with aspects of Amazon publishing, but nothing with everything you’d need to know in one place. This lead us to develop the exact solution we wished we had for ourselves. On the webinar I’m going to walk through the entire process of uploading your book files to CreateSpace, Amazon’s print-on-demand division. I’ll explain every entry field and what you need to know to get this critical part of your book production right the first time. This module is just one small part of the information in the Amazon Success Toolkit, which covers everything from setting up your titles to optimizing your book pages to dealing with Kindle Direct Publishing for your ebooks. Knowing how to optimize your books and their sales pages can have a dramatic impact on the number of books you sell on Amazon, and the Amazon Success Toolkit explains for the first time the 4 concepts you really need to understand to get the most out of Amazon. There’s really nothing else like it on the market, and I can’t wait to show it to you. To give you a little taste of what you’ll find in this groundbreaking product, here’s an excerpt that deals with the very first section of the upload process: setting up your title information. Below you’ll see a screenshot of this section of the upload form, and we’ve identified the 9 fields you need to deal with before moving onto the next section. The instructions below the screenshot follow the numbered fields in the image. Your title, entered on the previous screen will automatically populate here. You may change the title of the book here if you like. The subtitle of your book may be entered here. Enter the name, or pen name, of the primary author for the book. This name will be the first name to show as an author on Amazon’s product pages and in listings. You may add additional contributors to the book project, like co-authors, illustrators, editors, and just about anyone else that you want to have searchable, and up-front credit for the creation of the book. Often, authors will credit people and businesses only on the copyright or acknowledgements page of their book interior. However, selecting and adding people here will put them in search results on Amazon, so if you have a popular or noteworthy contributor, this is an excellent way to make them a part of the metadata and link them to your book. Check this box if the book is part of a series, like a trilogy or anthology. List the series title here. You may also select a volume number for this particular book to indicate its order in the series. The edition number is very important as you update and change the book for future iterations. Books with the same title & author, but with a numerically higher edition number, will supersede the previous book on Amazon’s search listings. The primary language of the book you are publishing. Choose a publication date, typically today’s date. For books that is being re-published, you may choose a past date. Note that you cannot select a future date at this time. For books launching later, you’ll need to enter today’s date. To delay the release of your book until the actual publication date, don’t approve your book proof until 48 hours prior to your book’s launch day. Thankfully, when you publish your ebook with Kindle Direct Publishing, you’ll find they have an automatic form of “Launch Control” instead this manual process. Click “Save & Continue” to proceed. Come and join us on Thursday for the complete walk through of the entire CreateSpace upload process. You won’t want to miss it. At the end we’ll show you everything in the Amazon Success Toolkit, and we have some very cool surprises for live attendees on the webinar. 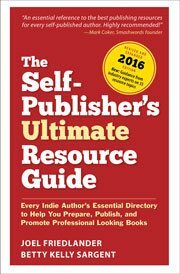 You are an extraordinary resource for us newbies and experienced authors alike. Thank you! My goal today was to upload my book to CreateSpace. I’m not sure I can wait until Thursday to get your CreateSpace wisdom! If you can let me know, is it possible to get the book in my hand within one week of uploading? If so, I can wait for your webinar to upload the book. I may just have to upload a second version. Thank you Joel! I look forward to the webinar on Thursday. I found this post via Chris Graham, the Story Reading Ape with heart, and the timing is perfect. Glad you found us, Tracy, see you on Thursday. Carefully consider the book category options that may apply to your new book. If you use one or more less-obvious categories you’ll likely face less competition in the rankings, and Amazon may display your book as a Hot New Release. My recent books have quickly cracked the top-100 list in multiple categories. This doesn’t make me rich, but it feels good. Also, if you have both ebook and pbook versions of the same title, you can assign them to different categories to improve the chance of a high ranking.